The Milky Way Galaxy contains roughly 100 billion stars - our Sun is one of these stars. Since we are actually near the outskirts of our galaxy, the COBE satellite was able to take this photograph of the Milky Way's core. The Milky Way is a typical spiral galaxy with a central bulge and an extended disk of stars. However, gas and dust within the disk obscure visible wavelengths of light effectively preventing clear observations of the center. Since infrared wavelengths, are less affected by the obscuring material, the Diffuse InfraRed Background Experiment (DIRBE) on board COBE was able to detect infrared light from stars surrounding the galactic center and produce this image. Of course, the edge on perspective represents the view from the vicinity of our Sun, a star located in the disk about 30,000 light years out from the center. There are approximately 100 billion galaxies in the observable universe which clump together due to gravitational forces to form galaxy clusters. The Milky Way and Andromeda galaxies, along with about fifteen or sixteen smaller galaxies, form what's known as the Local Group of galaxies. The Local Group of galaxies is on the outskirts of a "Local Supercluster" that is roughly centered on the Virgo Cluster of galaxies. Shown here are several galaxies of the Virgo Cluster, the closest cluster to our Local Group. The Virgo Cluster spans more than 5 degrees of the sky - about 10 times the angle made by a full Moon. It contains over 100 galaxies of many types - including spirals, ellipticals, and irregular galaxies. The Virgo Cluster is so massive that it is noticeably pulling our Galaxy toward it. Photograph made from UK Schmidt plates by David Malin. This figure shows the distant Coma Cluster of galaxies as viewed through a telescope with normal light and as viewed using x-rays. When viewed with x-rays, the image is sensitive to the high temperature radiation emanating from the cluster. The photo shows that "cluster" is a reasonable label since the galaxies are all imbedded in a bath of very hot gases - temperatures of roughly 25 million degrees. 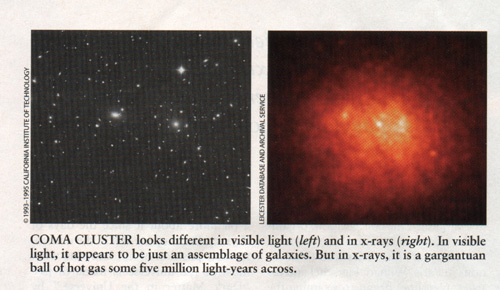 Credit: "The Evolution of Galaxy Clusters," by J. Patrick Henry, Ulrich G. Briel and Hans Bohringer in the December 1998 Issue of Scientific American. The largest structures of all are the superclusters, each containing thousands of galaxies and stretching many hundreds of millions of light years across space. These superclusters are arranged in filament or sheet-like structures, between which there are gigantic voids of seemingly empty space. Superclusters are also dynamic structures which are interacting with each other and other mysterious elements in the universe. Our Local Supercluster, along with a second supercluster, is moving at over 1 million miles per hour (600 km/sec) toward a structure called the Great Attractor, a region of space roughly 150 million light-years (one light year is about six trillion miles) away from us. This Great Attractor, having a mass 100 quadrillion times greater than our sun and a span of 500 million light-years, is made of both the visible matter that we can see along with the so-called dark matter that we cannot see. Compiled and Edited by P-I-A. Comments and Questions.